HRRN's Jock Talk show, episode #77. Presented by Tito's Handmade Vodka. 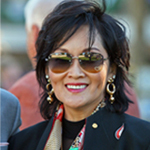 Kristina McManigell spends a full hour with Japan's first ever female jockey to ride at a major race track, Kaoru Tsuchiya.